Connect to your local AMS and click Backup plans and tasks on the Navigation menu. Then select the backup plan you would like to change and click Edit from the menu to open the Edit backup plan window. In the Where to back up section, click the blue Location… link to open the Location dialog box. Ensure that the top radio button labeled Store all machines’ archives in a single location is selected. 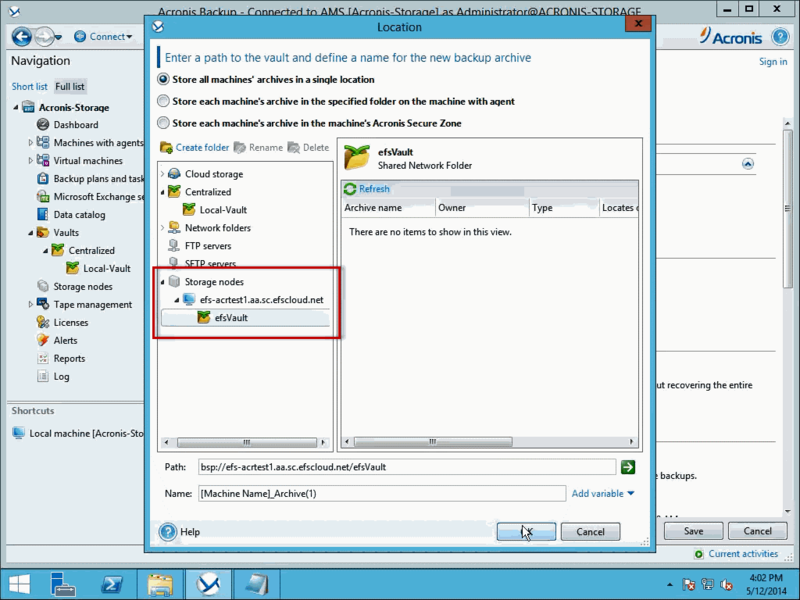 If storing the backup in a local vault, expand the Centralized section and select the local vault. 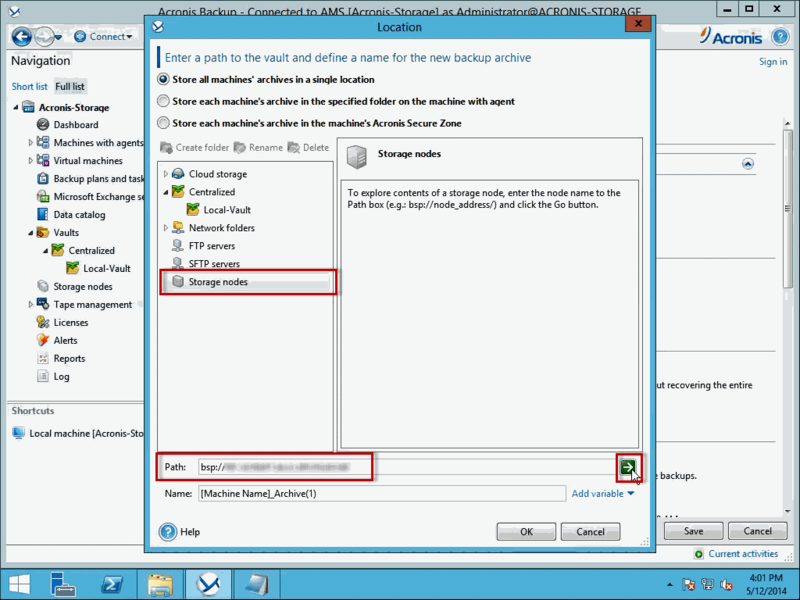 If you are changing the backup destination to an eFolder cloud destination, select Storage nodes in the left window. In the Path: field, enter the remote server address you were provided with when your eFolder Acronis Management Server was assigned to you. Important! When entering the address of an eFolder cloud location, you must keep the “bsp://” as part of the address. Also, you must click the GREEN RIGHT ARROW to connect to the remote storage node. (See Figure 6.6) If you merely click OK, it does not complete the connection and your archive will NOT be sent to the remote storage node. After clicking the GREEN RIGHT ARROW to connect to your eFolder AMS, the Access Credentials dialog box appears. Enter the username and password provided to you by eFolder when your eFolder AMS was assigned to you. After your credentials have been verified, expand the Storage nodes in the path window on the left. Then expand the node labeled with your AMS name and click the managed vault that you created previously. Then click OK to continue. (see Figure 6.7).